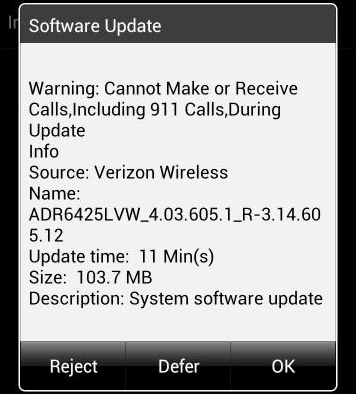 Verizon is possibly pushing out an over-the-air update v4.03.605.1 to the HTC Rezound which only just received ICS (v3.14.605.12) last week. 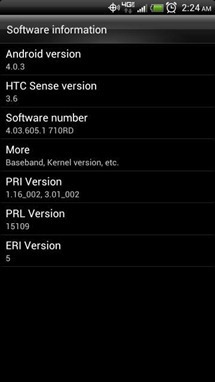 The 104MB update is pretty hefty for only a few weeks of work, which has puzzled many XDA members and made things turn pretty ugly in the relevant thread. The reason I'm saying "possibly" is only one person at XDA has received it so far, which may indicate there's some sort of soak testing going on. Update: A commenter (Cody) chimed in and let us know he's currently getting the OTA as well. Anyone else? Having now read through 20+ pages of comments about half of which are literally baseless and ignorant garbage written by trolls with nothing better to do (what XDA update thread would it be without these, right? ), I have pieced together a few details and confirmed that the OTA is indeed legitimate by verifying the update's cryptographic signature and checking with a source close to Verizon. Considering it's a late Sunday night/early Monday morning, I'm expecting details from another source very soon. Customers will see a notification on their device when the software update is available for their device. After the software update, customers will be able to take their smartphone overseas and use voice service in more than 220 countries and receive data in more than 205 countries. 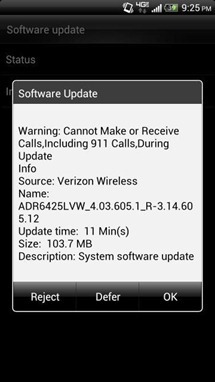 Considering the promised global features didn't make the ICS OTA as well as the fact that the new 4.03.605.1 OTA contains the same version of Android (4.0.3, IML74K), my guess is Verizon either needed a little more time to finish the global update or wanted to separate the already enormous release into two to keep its engineers sane. Whatever the case may be, the brave among you can flash manually and see for themselves. Signed by: HTC. "Issuer: C=TW, ST=Taiwan, L=Taoyuan City, O=HTC Corporation, OU=SSD, CN=HTC Cert/[email protected]" Full signature here. Full list of files in the update zip is here. Since I don't have a Rezound, I cannot verify these instructions, courtesy of our tipster dsb9938, so proceed with caution. Note: In steps 3 and 5, he refers to the OTAPkg.zip above. 1. Install the ICS OTA full firmware. 2. Boot it up at least once. I skipped setup and just let it boot. 4. Place the PH98IMG.zip on the SDCard. 5. Rename the entire package to Update.zip and put it on the SDCard. 7. Press vol up and power. 8. The update will start and patch your files. 9. 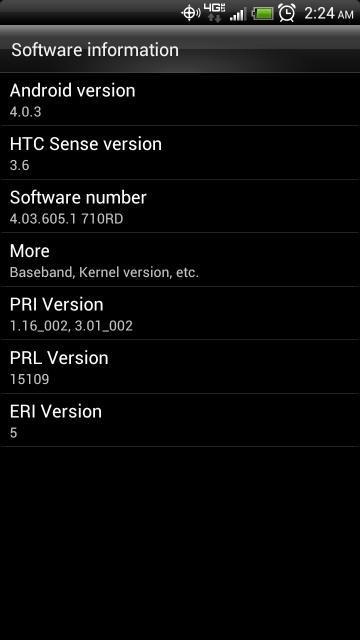 The phone will reboot to HBOOT and load the PH98IMG.zip file you put there. 10. Vol up to install. 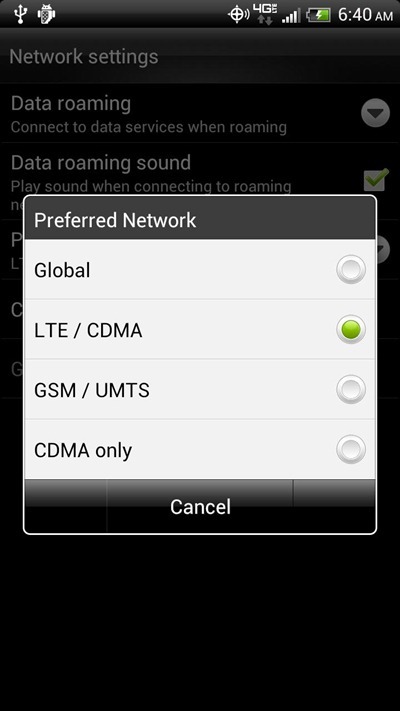 If you've successfully flashed the update and managed to figure out whether it contains global roaming or not, definitely drop a line in the comments and let us know. We'll even say thank you.